… the number of employee shareholders in Europe didn't increase last year, and the democratization rate of employee ownership went down. A new differentiation appears between top executives and other employees since the beginning of the crisis. The share held by common employees is continuously decreasing since 2009. At the contrary, top executives increased their share in companies' capital. As a consequence, the average capitalization held by each of the 8.845 top executives in large European companies raised to 9,1 million Euro in 2012, compared to the average capitalization of 11.500 Euro held by each of the 9,6 million common employee shareholders. 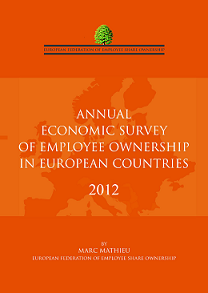 This picture of a first decrease in the democratization of employee ownership since the financial crisis may be related to some recent negative political orientations decided in a number of European countries regarding employee share ownership, for instance in Ireland, The Netherlands, France, or even in the UK. We have a selection of 23 remarkable articles in 5 countries in March 2013: France, Italy, Spain, UK, USA. France: Fluctuations of French policy regarding employee savings: Higher taxation now but lower tomorrow? President Hollande announces that employee savings will be unlocked in order to support private consumption. New employee share plan for Saint-Gobain. Some new workers' co-operatives. Debates about the governance of employee investment funds, the most usual way for employee ownership in France: Should the Board be elected by employee owners or should it be nominated by unions or others? Italy: Prysmian Group launches a new employee share plan, a remarkable example. New employee share plan for Telecom Italia. Spain: Hard times for Mondragon Corporation. UK: Worries about Government's stance on employee share schemes: Employee share ownership is apolitical, but is now attached to quite a political idea. "Employee ownership" rather than "employee share ownership", a strange race in the UK. In a new report, the Employee Ownership Association announces the Employee-Owned Business sector has just jumped from 2 to 3% of GDP. Government opens tender for Royal Mail employee ownership. USA: Employee buyout, a win-win-win solution for Kewaunee Nuclear Power Station?